Grilled Cilantro Lime Chicken Skewers – This is the most tender and most flavorful chicken you will ever make! The chicken gets marinated in a honey, lime, cilantro, garlic, and soy sauce marinade for a few hours, skewered, and then grilled. Super easy and always a hit! Perfect for serving a crowd. And the bizarre weather continues…Two weeks ago the city was on lockdown due to “snow” and now it’s 70 degrees outside. In January! But I’ve barely had enough time to wear my boots. Please come back cold weather. Pleeeeease. But don’t worry guys: this weekend we were hit with a monsoon so I’m sure that means winter is coming, right? Is that how weather works? Because it’s been so warm this past week, we’ve been grilling up a storm. 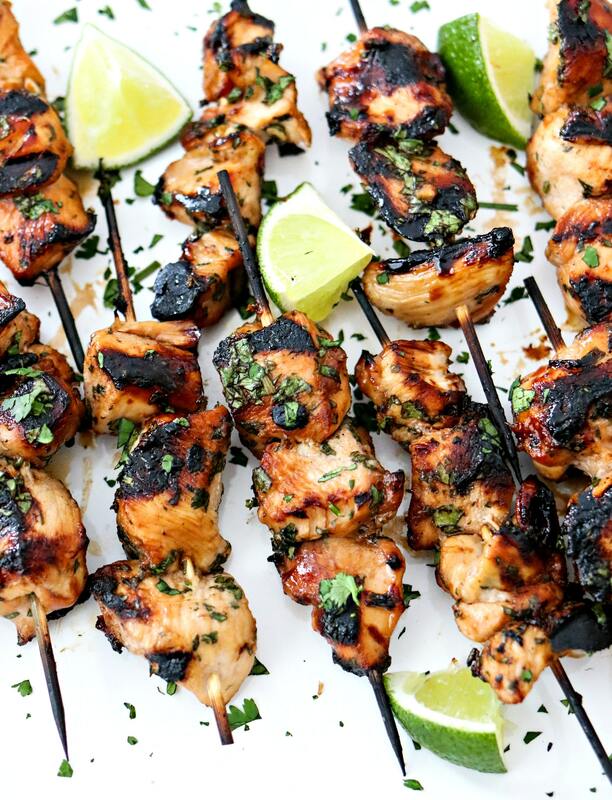 One of my favorite recipes for the grill are these grilled cilantro lime chicken skewers. I first made these for a tailgate party last fall and fell deeply in love with them. I love making skewers for a crowd because it’s so easy to eat standing up. No need for forks and knives when you can eat off a stick. Plus, you can only have so much chips & dip. Let’s get some protein up in there! I knew the skewers would be convenient but I was shocked by the flavor and tenderness of the chicken. This recipe calls for the chicken to marinate for at least 3 hours, which helps get the chicken super tender. It also helps the chicken absorb the marinade so when it gets grilled, it gets super caramelized. So don’t skimp on the marinating time! This recipe is so super simple. All we’re doing here is whisking marinade ingredients together, tossing over cubed chicken, marinating for 3-8 hours, skewering, and grilling. That’s it! It’s perfect for when you have a huge meal to make and want one less thing to worry about. Just start this about 5 hours before you want to eat and then forget about it until grilling time. Please, for the love of everything that is yummy and delicious, use fresh squeezed lime juice. I have seen too many people use store-bought juice for recipes and it’s just not the same. There are preservatives in that juice to, well, preserve it. These preservatives changes the flavor of the juice. You get much better flavor from the fresh stuff. You’ll need 2-3 limes to make 1/4 cup of juice. Honey can be extremely difficult to measure because it gets stuck in the measuring utensil. Here’s a tip for ya: spray the measuring cup or spoon with non-stick spray before adding the honey. This will make sure it comes out clean without much help. Before cooking with wooden skewers, you must soak them in water for about 20 minutes. Don’t forget this or your skewers could catch on fire! You’ve been warned. If you don’t have a grill, you can easily make these in an oven. Set the oven to broil on high. Place skewers on grill pan or wire rack and place in oven. It will probably take an extra 10 minutes than it does on the grill. But always keep an eye on them! I hope you love these chicken skewers! What other ways do you enjoy making skewers? I usually make chicken skewers but I am looking for some great beef recipes. Let me know if you have one! Here are all the kitchen tools and serveware that I used in this post. For each item that is sold, I receive a small commission. Thank you for supporting the brands that support CPA! This is the most tender and most flavorful chicken you will ever make! The chicken gets marinated in a honey, lime, cilantro, garlic, and soy sauce marinade for a few hours, skewered, and then grilled. Super duper easy and always a hit! Perfect for serving a crowd. Slice chicken into even 1-inch cubes. Place chicken in a gallon-sized storage bag. Place remaining ingredients in a medium bowl and whisk to combine. Separate 1/4 cup of marinade and place in small bowl and store in fridge until cook time. Place marinade in storage bag with chicken and seal tightly. Shake chicken around to coat completely. place bag on a plate or baking dish. This is helpful in case the bag breaks - you won't have a huge mess if there's something there to catch all the marinade. Place chicken in fridge to marinate for at least 3 hours or up to 8 hours. 30 minutes before cook time, soak your medium wooden skewers in water for 20 minutes. This will keep them from catching fire during grilling. Remove from water and place on paper towel to dry slightly before skewing. Remove chicken from fridge. Grab 1 skewer and place 3-4 pieces of chicken on skewer, leaving about 1 inch of free space on both ends of skewer. Repeat with remaining chicken. Preheat grill to medium-high heat. Place all skewers on grill. After 3 minutes, spread remaining marinade on chicken and then flip so it can finish cooking. Do NOT brush marinade on cooked side. This will cause contamination between cooked and not cooked chicken. Grill for another 3 minutes, or until chicken is done. If you don't have a grill, you can easily make these in an oven. Set the oven to broil on high. Place skewers on grill pan or wire rack and place in oven. It will probably take an extra 10 minutes than it does on the grill. But always keep an eye on them! Can you make this with chicken thighs? Yes of course! I think the cook time for thighs is longer than breasts so keep an eye on them to make sure they cook through. Thanks for using my post!! I’ll make sure to share on my social media accounts. Oh my gosh those look delicious! This recipe reminds me of summer! These look DELISH! Perfect for a BBQ. Pinning now! I love the color from the grill on the skewers and the sauce looks so flavorful! Just looking at these pictures makes me think of summer and pool parties or long beach days. The weather has been so kooky everywhere, but no matter what, we can always grill in Phoenix! I love this recipe and how simple it is. Your pix are gorgeous!! Yum! Love chicken skewers will defiantly be giving them a try. am really looking forward to giving this one a try! Wow, these look amazing! I know my family would just love having this for dinner! i am always looking for new ideas with chicken and this looks super delicious!!! yum! We’ve had some crazy weather around here too! Still not warm enough to grill, but I cannot wait. I LOVE lime cilantro anything! Can’t wait to try! Thanks! You can also make in your oven using the broiler! Ok I haven’t grilled in weeks. This looks exactly like what I want to do next. These sound just like what I need. So bored with chicken lately! These look amazing! Perfect for the warmer weather grilling out. YUMMMM! Thank you! I also love making this recipe in the oven with the broiler! This looks delicious! Will have to try! Thanks for sharing such an amazing recipe! I am a HUGE fan of cilantro so this chicken is right up my alley!! Looks DIVINE! I definitely plan to try these. My husband is on a paleo diet so these are a great addition to our recipes! pinned the chicken skewers. Love making chicken on the grill, but will have to wait for better weather to try it out. If you can’t wait, you can also make in the oven on Broil! These look so delicious! I love lime and cilantro flavored chicken and this recipe looks so fresh! Pinning for later! These look so delicious! I have to pin so that I can make these later! Thanks for sharing! These chicken skewers with lime looks so good. Seem really easy to make. This is the kind of meals my husband enjoys making. Glad I could help! You can also buy metal skewers, if you want something to reuse.